29/5/10 – Acquisitions – Paris, Bibliothèque nationale de France – Two globes, one of the earth and one of the heavens (ill.) dating from 1728-1730, of remarkable aesthetic quality as well as of high scientific interest, have been donated to the Bibliothèque nationale by the Club Français du Livre. Both of these objects had been listed as Trésors nationaux in 2007 and were acquired from the Steinitz Gallery for 150,000 €. Designed and produced by Abbé Nollet (they both bear the notice “mounted by the author”), who invented many scientific instruments and was famous for his vulgarization work, they were dedicated to Anne-Louise-Bénédicte de Bourbon-Condé, Duchess of Maine and Louis de Bourbon-Condé, Count of Clermont and come from the château de La Roche-Guyon. The fund-raising drive published in the Journal Officiel states that they “constitute rare pieces of evidence in the history of science and important milestones in French cartography. One of the only two known pairs of eleven pieces found in the world, this pair of globes corresponds to the third state of instruments described by Abbé Nollet in his work published in 1738, the Catalogue raisonné des instruments qui servent aux expériences. The celestial globe also represents the only inventoried example presenting this unusual colouring, which is a forerunner of 19th century astronomy.” The globe of the heavens, painted in blue – which has turned into a beautiful green colour – presents the characteristic, preceding that of the 19th century, of focusing on the stars, highlighted in gold, rather than that of the constellations in the form of mythological figures. 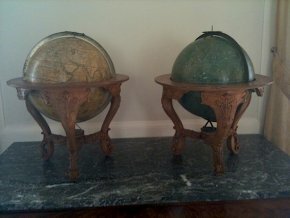 We point out that both of the globes still have their bases in sculpted wood of Rocaille style and we take this opportunity to express our regret that the immense Coronelli globes, much more monumental in size it is true, are displayed at the Bibliothèque nationale (Tolbiac site) without their supports which are from the 18th century, in marble and bronze, but have been relegated to storage due to their weigh, implying simply that they should be presented elsewhere.